At Andis, we understand your passion, your commitment to your horse and your desire to keep your horse in optimal health- and appearance. We have a model, a size and a price range to fit every budget and every need. Andis Company traces its roots back to when Matthew Andis was working at Mitchell Motor Car Company in Racine, Wisconsin, USA as a tool maker and he decided to leave and start his own business. Andis quickly developed the Andis Electric Clipper and began Andis Clipper Company, which evolved into the Andis Company of today. It was officially incorporated in the year 1922. What Set Andis Clippers Apart From The Competition? The advantage the Andis clipper had is that it was smaller, faster and delivered a higher performance than other clippers available at the time. This clipper was the first generation of today's Master Clipper, which is still one of Andis' most popular models. Is It True That Andis Clippers Are Available Throughout The World? Yes! Andis continues to grow globally. Almost 80 years ago Andis introduced products to Europe and today these products are available in 90 countries around the world. Barbers, stylists, groomers, and consumers everywhere continue to reach for Andis clippers, trimmers, dryers, blades, curling irons and flat irons when they need top- performing tools. Which Are Andis’s Most Popular Clippers For Horses? The Super 2-Speed Detachable Blade Clipper with T-84 Blade is one of our best-selling tools for efficient, reliable equestrian clipping and carving. The clipper’s shatter-proof housing, quiet noise levels, and a blade that stays cool makes this a great option for high-volume clipping and detailed trimming. 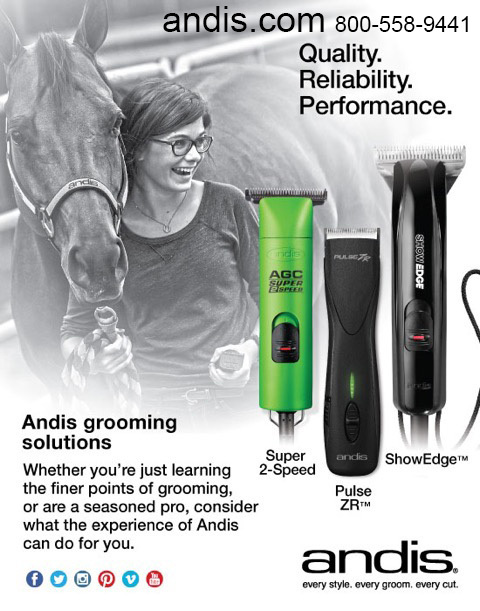 Andis 5-Speed Cordless Pulse ZR represents the future of equestrian grooming and clipping. The blade speed versatility, coupled with detachable blade technology make the Pulse ZR the perfect option for groomers on the go. Additionally, the Pulse ZR stays charged for two hours on just a two hour charge. The Andis ShowEdge Detachable Blade Equine and Livestock Clipper is a great tool for experts and beginners alike. The Andis ShowEdge Clipper has a unique, angled clipper head that allows for easy access in tight areas. It’s tether cord provides extra security against accidental drops. What Sets Andis Clippers Apart From Competitors? Andis is proud to manufacture tools in the United States for the people who demand the most from their tools, whether it’s for day-to-day grooming and maintenance to getting your horse ready for competition. Many horse tack and feed stores carry several of our models making our clippers readily accessible to the horse owners. How Should I Maintain My Andis Clippers? The number one rule of keeping your clipper maintained is to keep your blades well oiled. When your blades aren’t working correctly, they force your clipper to do extra work that then makes it too hot. First, clean out excess hair with a soft brush. Then turn your clipper on and use Andis Clipper Oil on each side of the blade. Wipe the blade clean and you will be ready to get back to work! Why Are Andis Clipper Oil Products The Best? Andis has specifically designed our oils for the care and longevity of our clippers! It is crucial to regularly clean and disinfect your blades. Spray Andis Blade Care Plus on your blades once a week or after grooming a horse with any kind of skin ailments. The 7-in-1 solution is Vitamin E-enriched and it disinfects, cleans, cools, lubricates and prevents rust all at once. For a faster and more direct spray, I would recommend Andis Cool Care Plus, but use this product outside. Make Sure To Order Your Andis Clippers Today! Conveniently found in leading catalogs like Jeffers Equine, ValleyVet, SmartpakEquine, Dover Saddlery, Smith Brothers and more, you can also find our clippers at most local tack and feed stores. You’ll love the ease of use, quiet motor and longevity. Most of all- you’ll love the results! Be sure to call and order today! !